When you have young children, holidays are rarely relaxing experiences. Sure, it’s fantastic to have some free time on your hands, but when you are away from home there is no childcare to rely on, and all that time needs to be filled with enjoyable activities for the kids. In short, it’s a lot of hard work, and the chances are that you will feel like you need another break by the time you get home. Things get easier as the little ones grow, apparently, but for the first 5-6 years, holidays can be tough and challenging. There are, however, a few things you can do to make sure you get some time to relax – let’s take a look at some of your options. Be careful with destination choice! Unless you want to spend your hard-earned holiday time with a bunch of bored, irritable kids, make sure you do some thorough research on your destination. You might think that the whole family is going to love spending days hiking, walking around museums, or browsing around the town centres of historic towns and cities – but trust me, your kids will have different ideas. Also, that dream trip away to the Caribbean might be financially viable, but you can bet that your children won’t appreciate the nine-hour flight there and back – and it will take them days to recover from the experience. Whatever type of holiday you want to experience, you’ll need to ensure you are welcome as a family. Not every hotel or resort welcomes young kids, and there are a few positive signs to look out for. Family rates and rooms are an obvious example, and anything that states itself as ‘romantic’ or ‘intimate’ is probably best avoided! Finally, make sure you do some research on the type of person that goes to the resort you are considering. Sadly, there are plenty of people out there that have a snooty attitude to young children, and although you could be rebellious and not give a fig, the endless tutting and frowning you might experience gets pretty tiresome after a day or two! It’s easy to be snooty about all-inclusive holidays when you are young, free and single. But they are a godsend for tired parents. Many all-inclusive resorts have kids clubs, babysitting services, and are focused primarily on giving your little ones – whatever age – a fantastic time. Another benefit is the all-you-can-eat buffets. If your kids – rather inevitably – decide they don’t like their meal, after all, you can just go grab them something different at no extra cost. Cruises are another all-inclusive option. Again, perhaps not something you might consider when you are holidaying alone or as a couple, but as you can see over at the Bolsover Cruise Club there are plenty of child-friendly holidays to choose from. Just be sure to make sure you are looking at family cruises rather than romantic breakaways – which will only end up as a nightmare. If you have good friends or close family members who also have young children, it’s a brilliant idea to plan your holidays together. Not only will the little ones have playmates, but each family can also take turns babysitting. Going alone as a family will often mean you don’t get the opportunity to spend some quality time with your partner, and if you do manage it, you will have to rely on sometimes expensive babysitting services. As tempting as it might be to pack your day with fun-filled activities, the reality is that your children will have a fantastic time just playing about in the hotel pool. So, for every morning you go out, make sure you have an afternoon by the pool or on the beach. You have to actually plan for downtime every day, or you will end up with a bunch of irritable, tired children. Wherever you end up going, make sure you have enough food to give your kids – failure to pack snacks is a criminal offence in their eyes, and they won’t let you hear the end of it. Angry hunger tantrums won’t finish until appetites are sated, and unless you want to spend a fortune on overpriced tourist food, you’ll need to make sure you bring plenty of sustenance along with you. Financial burnout is a common thing to suffer on holidays, too! So, when you have kids who aren’t at school yet, take advantage of the off-peak rates – you won’t be able to do so again for at least another 12-13 years. I’ve spoken before about the eye-watering cost of trips away during the summer holidays, so if you can fit in as many off-season breaks away before your little ones hit 5-6, you can see some amazing places for a fraction it will cost you later on down the line. You’ll also find that everything from activities to eating out will be a lot less expensive than it is during peak times, and you will be able to afford a lot more fun and games for your kids. Finally, you won’t need me to tell you how much stuff you need to take with you when on holiday. When you have young children, even a trip to the supermarket involves enough stuff to make it look like you are going away for the weekend. And don’t forget that whatever you bring with you, you’ll need to take back. Unless you want to start packing for your return over the last 3-4 days of your holiday, it’s a wise idea to lighten your load as much as possible. 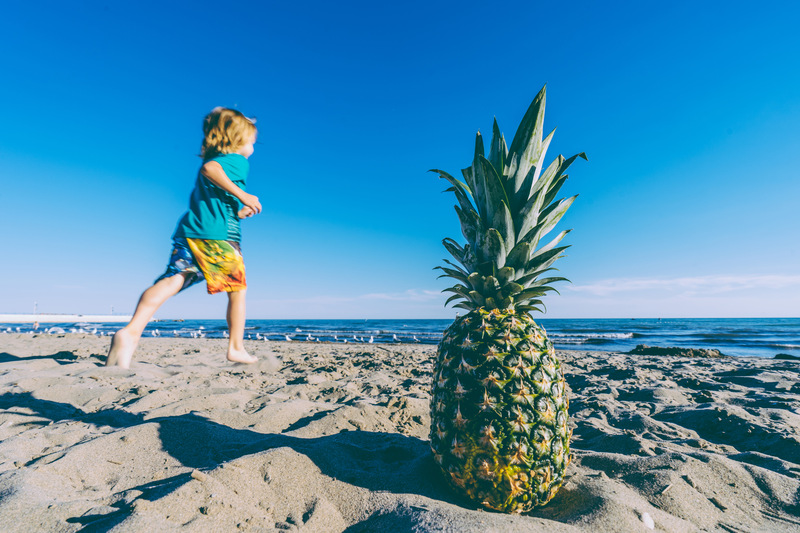 Many family-friendly hotels and resorts have plenty of things you could use – many of them for free, and others with a small surcharge – so contact them beforehand and see what they have on offer. If you are struggling to decide what you should and shouldn’t take, there’s an excellent book available called ‘The Packing Book’ by Judith Gilford which has some fantastic tips. Holidays with small children can often be a nightmare, and far from the relaxing experience, they should be. Hopefully, these tips will help you actually get some downtime and the relaxing break you deserve! Are You In Need Of Fresh Perspective?